In 2017, Betsy returned to Florida to live at the Ellie Schiller Homosassa Springs Wildlife State Park in Homosassa, Florida. Betsy was born to Amanda on October 19, 1990 at the Homosassa Springs Wildlife State Park in Homosassa, Florida. She is the sister of Ariel, who is also a Save the Manatee Club adoptee. For 20 years, Betsy called the park home, but in November 2010, she started living in a new temporary home – the Cincinnati Zoo in Ohio. In October 2017, she returned to Florida to live once again at the park with Ariel and Electra, two other manatee residents. See a photo of Betsy in the Citrus County Chronicle as she is being prepared for the move. Betsy was named after Park Ranger Betsy Dearth, who took care of the manatees and was a long-time employee at the park, which is now known as the Ellie Schiller Homosassa Springs Wildlife State Park. Betsy the manatee has been described as curious, thoughtful, and observant by park employees, and she was nicknamed “The Inspector,” by Ranger Dearth. 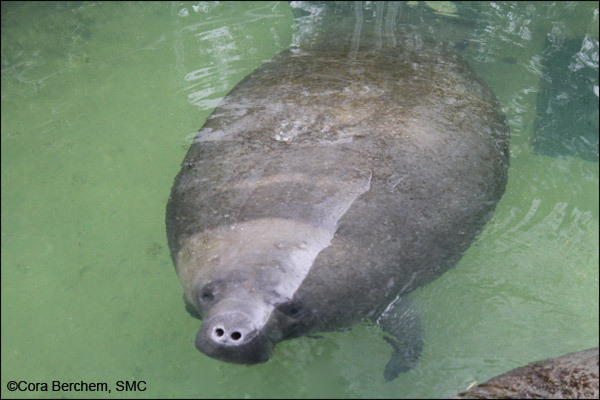 Betsy was known to welcome any new manatees that arrived at Homosassa, and she would be the first to investigate a fallen tree limb or any other new object that entered the spring. Once, when a film crew came to make a documentary at the park, Betsy delighted in frolicking and playing for the cameras as well as following the camera crew. Betsy has been described as curious, thoughtful, and observant by park employees. When some construction took place at the manatee area, Betsy took great interest in the sandbags being used and “helped out” by pushing them around with her nose. Visitors attempting to take a photo from the underwater observation area, known as the “Fish Bowl,” would often get up close and personal with Betsy when she would push her nose right up against the window glass. Betsy liked to splash water with her head to get attention during the manatee education programs. She would also raise her head above the water and wiggle her top lip at the ranger or volunteer handing out vitamin treats, which are part of the manatee’s diet. She may have learned this “smile” from her mother, Amanda, who apparently started this practice. You know what they say: “like mother, like daughter.” When given carrots, Betsy would only eat a few and hold out for the tastier vitamin cookie treats. In Cincinnati, Betsy was sharing tank space with two other manatees who were both rescued from Florida and are continuing their rehabilitation in Ohio. According to zoo staff, the three all got along well, and Betsy, by far the largest of the three at 1,800 pounds, perhaps served as a sort of “big sister” for the others. Zoo staff say that the three manatees were observed taking naps together near one of the logs in the exhibit. Betsy is an ambassador for all manatees, and when you adopt her, you are helping all manatees to survive. Each person who adopts Betsy will receive a full-color photo, biography, and adoption certificate, as well as a membership handbook and subscription to The Manatee Zone, a newsletter featuring updates on the adopted manatees when they are sighted, and Paddle Tales, Save the Manatee Club’s bi-monthly eNewsletter. For more information about adopting Betsy, go to Save the Manatee Club’s Adopt-A-Manatee page, or call 1-800-432-JOIN (5646). If you are in Florida, you can visit Betsy and the other manatees at the Ellie Schiller Homosassa Springs Wildlife State Park. 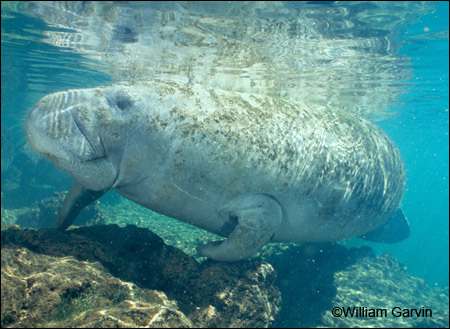 And be sure to check out other manatees on the Blue Spring webcams at ManaTV.org.